Sometimes you just want to spend minimal money on make-up but still look good. And I am here to say that there are plenty of drugstore beauty brands that are really good. However, I tend to be a make-up and skincare snob. Yes, I will raise my hands and admit it! So I set out to prove my own snobbery wrong and test out some of the best drugstore beauty buys. And guess what? I was very pleased indeed – here are some of my favourites. I love products that are easy to use and provide some sort of easy, multi-tasking benefit. So yes, that means I love a product that comes in a stick form! This Revlon Insta Blush in Berry Kiss is perfect to dab onto cheekbones for the perfect flushed cheeks. It’s also really easy to blend in and won’t leave those tell-tale streaks. Whew! Again I love a product that comes in the form of a stick. This Revlon PhotoReady Insta-Fix Foundation is more of a retoucher so you can use it over your existing make-up for touch ups on the go. We all need this one in our bags – trust me! I have been using it on spots or to fix up any make-up that ends up looking blotchy by the end of the day. I think because I am addicted to hot drinks my lipstick fades pretty quickly so I am always on the lookout for long-wear lip products. I’ve been super impressed with the Revlon Colorstay Overtime Lip Color (this is a dual-ended lip colour and top coat). It just sticks! But unlike a matte lipstick it won’t dry your lips out. There is a moisturising glossy top coat that you apply over the colour formula that helps keep your lips feeling moisturised. This honestly lasted me hours without fading or smudging! I honestly love cleansing oils so much. They are perfect for a double cleanse routine as they won’t strip the skin or make it feel tight from moisture loss. And as we all know Simple are pretty affordable so if you haven’t given a cleansing oil a go, try this one out as it delivers some serious bang for its buck, rivalling many more expensive cleansing oils out there. This one has 100% grapeseed oil which is amazing for the skin. I used to buy it from the supermarket and slather it on as a body oil – no joke! A good make-up brush can make less expensive make-up look expensive. 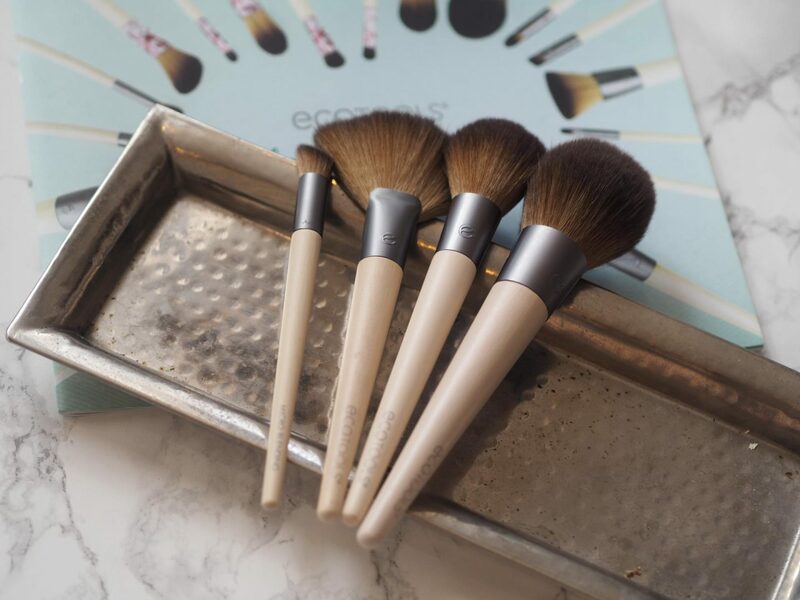 One of my most favourite and affordable beauty brush brands is EcoTools and not only are they affordable but they are also cruelty-free and made of recycled materials. Seriously how do you get any better than that? They have also just celebrated their 10-year anniversary and with it launched this limited edition brush collection which comes in a fabulous copper holder which is perfect for on-the-go and keeping all of your brushes organised. There are 6 brushes in the set that cover every brush need you could ever want from highlighting, taming brows, contouring and definition. Nope not just another mascara! This one is actually specially formulated for people with sensitive eyes and skin as well as contact lens wearers. This mascara also doubles as a lash serum with conditioning Arginine Oil which helps lashes get stronger over time. This is a fabulous drug-store beauty from French pharmacy brand La Roche-Posay. P.S. it also doesn’t smudge! iZ London first came to my attention for their chrome pigment powders (chrome nails YAS!) which I will tell you about in a minute but their nail polishes are pretty fabulous too. The whole point of them was to give nails a gel-finish without having a UV lamp so these are all about the high-shine. And as a gel nails addict I was really impressed! I also love that the colours come in 6ml bottles so that the colour doesn’t go to waste. Because how many of us actually use nail polish down to the last drop? Hardly EVER! There are 40 shades in the range and I’ve got a range of colours for spring including Lily, Pink Blossom, Hot Chili and Wisteria Lane. I love the fiery red of the Hot Chili – a classic colour that will never go out of style. In regards to the chrome nails, this is THE season for them and if you want to get the look at home look no further. iZ London have brought out a range of chrome pigment powders – I’ve got shades Liquid Gold, Rainbow Daze and Liquid Gold. How to apply? Well you first apply your chosen gel polish base and let it set. You then next apply a no wipe gel polish over the set colour and let this cure. The next step is to apply the chrome powder – you can use a brush or a gloved finger and a little goes a long way! Simply rub the chrome powder all over the nail, distributing it evenly. To make it stick you need to create some friction, rubbing the powder onto the top coat with an up and down motion. Once you are happy with the finish you simply need to apply one more no wipe top coat and let it cure! Talking about mascaras Rimmel has just launched a new one called Volume Shake. This is actually very cool in the fact that the mascara employs a shaker system that refreshes the volumising formual whenever needed so the mascara doesn’t dry out or get clumpy. This is a great way to extend the life of a mascara as well and the formula is nice too. Apply two coats for extra voluminous lashes that others will definitely bat an eyelid at. I’ve always been a fan of Barry M Nail Polishes. I think they really pack a bang for their buck! These are the newest shades in the Barry M collection which is the Molten Metals which all have a gorgeous metallic finish. These will be perfectly matched with sunkissed limbs and will look fabulous on either the hands or toes. There’s a shade for everyone with these and the good thing about them is that they dry really quickly! Summer is around the corner and with it the chance to bare those legs! And I want to make sure that if I am baring my legs that they look their best. So over my spray tan I like to use this Barry M Tahitian Body Oil which smells amazing (if you like the NARS Monoi Oil this is a good and less expensive substitute). It’s kind of like a holiday in a bottle and leaves the most subtle of shimmer behind while at the same time moisturising the skin. Get ready for the glow! Some more good shades for summer are the Barry M Coconut Infusion Gel Nail Paints which are super bright and fun colours for the warmer weather. Again these are going to go perfectly with a tan and they also contain coconut oil to help nourish and hydrate the nails. I know that I’ve gone a bit shellac mad lately on my nails so I am going to give them a break for awhile and switch back to regular polish. Can’t wait to use these – my favourite shade in the collection has to be Lemonade for summer! New from Barry M for this season is also the Strobe Cream which gives your face a lovely glow with a sheer finish so it’s not too heavy. Just dab on the tops of cheekbones and under the brow bone for an instant lift with the lighter cream and with the bronzing cream just dab and blend on the spots onto your face where the sun would hit naturally (tops of cheeks and forehead). Voila – instant glow! Another affordable star buy is the e.l.f. Studio Matte Lip Color in Wine. I love this deep burgundy red shade – it’s perfect for any time of the year when you want to create the ‘power lip’. This pencil as well you never need to sharpen – another reason to love it. I’m so excited that e.l.f. has just launched in the U.K. exclusively at Superdrug. I’ve been using this brand since I was a university student back in the States and I remember how excited my friends and I were when it launched because it was a cool make-up brand that we could actually afford! The e.l.f. HD Powder is one of the star products from the range – it’s translucent but creates a smooth, flawless image and blurs imperfections. Think of it as an Instagram filter brought to life. What are your favourite drugstore beauty buys? Anything you can’t live without?